We are instrumental in offering precision engineered Plain Split Clamp in a variety of specifications. Plain Split Clamp finds wide application in ceiling suspension or vertical wall mounting of piping. Our Plain Split Clamp is fabricated using pristine mild steel which is electro galvanized ensuring enhanced service life. Both clamps are ribbed for providing additional strength. The lips are provided with additional thread lengths by means of extended collard tap holes. In addition to this, welded side nuts have been provided for pipe size, Od 100 mm and above. 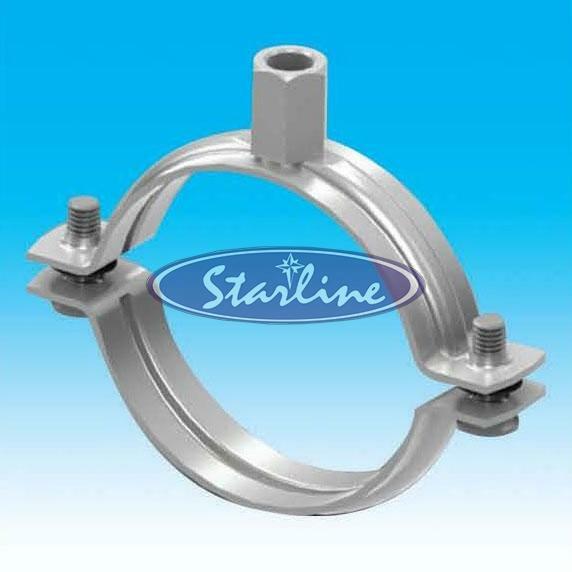 Suspension nuts have threads, M8, M10 for flexibility of installation. Moreover, side bolts have slotted cross head for ease of tightening. Our Plain Split Clamp is reasonably priced not to burn hole in the pockets of our valuable customers. To achieve good sound suppression, do not overload fitting.